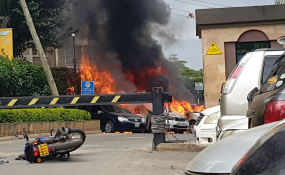 Kenyans online are up in arms against the New York Times after it published photos of bodies of the Riverside attack victims. The photo taken by an Associated Press photographer Khalil Senosi had bodies of victims inside the Secret Garden Café. The New York Times writer of the article Kimiko de Freytas-Tamura, who says is the incoming NYT bureau chief for East Africa, had started by telling Kenyans to direct their anger to the photo desk and NYT. "As I've said, I don't choose the photos. Please direct your anger to our photo department. Thank you," she responded to one of the tweets. As the protests increased, she was forced to rethink her responses to state that she had notified the relevant desk. Kimiko tried to explain that it was Times' policy to publish images of casualties as long as no faces were shown. "It is Times policy to post pictures of casualties - as long as their faces are not shown - in terror attacks whether they happen in Europe and the United States. I'm not being dismissive, just explaining what the Times does," she wrote. Kimiko after a back and forth with Kenyans online penned an apology writing, "I apologize on behalf of @nytimes and @nytphoto for causing anger and anguish over the photos that have been published with our reporting. Thank you." Kenyans demanded that the photo is pulled down from the website and by the time of our publishing it was still up.